Which the young day was wont to fling through space! Agony stares from each grey face. And yet the day is come; stand down! stand down! The frost has pierced them to the bended bone? Melting the ice to shave his grotesque chin! Go ask him, shall we win? Some formless haunting of some corpse’s chaps. The minenwerfers have it to the inch. The ice-bound throat gulps out a gargoyle shriek. Our tour’s but one night old, seven more to cool! And freeze you back with that one hope, disdain. Edmund Blunden, "After the Bombing"
Its bulk as though to eternity there to stand. Gorging the space; it could not be mine to foretell the means, the hour. But nature whispered something of a longer lease. Of a most ingenious but impermanent claim. 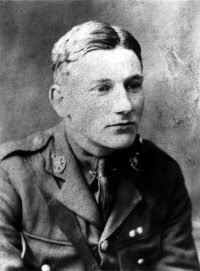 Edmund Blunden, "Vlamertinghe: Passing the Chateau"
Edmund Blunden, "Report on Experience"
His health, his honour and his quality taken. This is not what we were formerly told. God bless us all, this was peculiar grace. Glance, sympathy, note, like one from Eden. She turned to harlotry; — this I took to be new. Say what you will, our God sees how they run. Over there are faith, life, virtue in the sun. Edmund Blunden, "1916 Seen From 1921"
Sweet Mary’s shrine between the sycamores! Take a steady look at it; it’ll do you good. Here, these glasses will help you. See any flowers? That’s where the difficulty is, over there. The shoulder of the chalkdown convulses. From the poisonous smoke–past all impulses. Nor the blue javelin-flame of the thunderous noons strike fear. Edmund Blunden, "Concert Party: Busseboom"
Time light as sunbeams ran. And dance to the latest air. Were kicking men to death.